In what one economist points to as a troubling trend for the state's economy, wage increases for Honolulu workers were not much greater than inflation in the third quarter of last year, data released yesterday by the U.S. Department of Labor indicate. Despite surges in some occupations, such as the red-hot construction sector, overall wages in Honolulu's tourism-driven economy rose just 5.4 percent in the third quarter of 2005 compared with the same period in 2004. That compared with a 3.8 percent rise in Honolulu's consumer price index for 2005. Statewide, wages grew 5.8 percent, versus a 6.1 percent increase in the nation as a whole. "The good news is you're keeping up with inflation," said Charlotte Yee, regional economist with the Labor Department's Bureau of Labor Statistics in San Francisco. The bad news, said Bank of Hawaii chief economist Paul Brewbaker, is that living costs are beginning to creep up almost as fast as wages. The Honolulu cost-of-living index for the second half of 2005 rose 4.5 percent, suggesting that wage gains in the latter part of the year exceeded living-cost increases in Honolulu by less than one percentage point, Brewbaker said. The numbers, Brewbaker said, suggest that workers in Hawaii have been willing to accept middling wage growth in exchange for an exceptionally stable job base with a phenomenally low unemployment rate. For more than a year, Hawaii's unemployment rate has hovered below 3 percent; for February it was 2.5 percent, or about half the national rate of just less than 5 percent. Although the situation has meant that almost anyone wanting work can find it, the slow growth in wages could present problems over the long term in an atmosphere of sharply rising living costs, Brewbaker said. To be sure, there are exceptions. 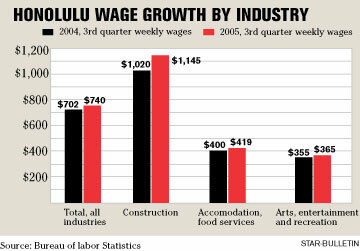 Construction wages in Honolulu grew by a whopping 12.3 percent in the third quarter, to $1,145 a week. More striking, the wage rise came as the number of construction jobs grew by 13.3 percent, to 24,028. But wage growth for other occupations was only fair. For example, hotel and restaurant jobs, which represent about one-eighth of Honolulu's total job base, enjoyed lower-than-average wage increases of just 4.8 percent. And some tourism-related jobs -- particularly those encompassed by the arts, entertainment and recreation field -- showed wage gains of just 2.8 percent. The Honolulu numbers were consistent with the state as a whole, although some neighbor islands enjoyed significantly higher wage increases. Hotel and restaurant wages on Maui, for instance, grew by nearly 7 percent. The lackluster wage growth comes against a backdrop of steeply rising living costs, particularly housing and utility bills. For 2005, costs for shelter increased by more than 5 percent, while household utilities surged more than 11 percent. This trend has to change, Brewbaker said, or workers eventually will not be able to afford to live in Hawaii. "Your only option at that point is -- beam me to Las Vegas, or take a plane to Utah," Brewbaker said.